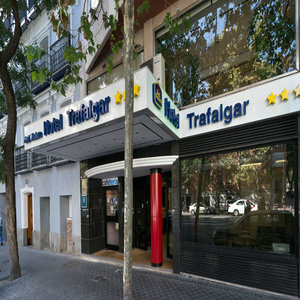 Hotel Trafalgar is located in Madrid?s ChamberÃ­ district, 250 metres from Iglesia and Quevedo Metro Stations. It offers comfortable, air-conditioned rooms with plasma-screen TVs. This small hotel features simple, modern design with lots of natural light. The hotel?s Trafalgar restaurant is open from Monday to Friday, serving typical Spanish cuisine. The Trafalgar is just a few Metro stops from the historic city centre, the Art Triangle and Retiro Park. Bilbao Metro Station is within a short walk, and provides direct access to Madrid Barajas Airport. The Trafalgar is a 10-minute walk from the Sorolla Museum, and there are many book shops and art galleries in the surrounding streets. The nearby Chueca district has many lively bars and clubs. Guests receive discounts at a nearby car park.